Drawing conclusions is almost never a good thing. However, I have come to the conclusion that power metal is the European equivalent to metalcore in America. The genres constantly pop out new bands, and trying to find something truly excellent is like attempting to find a gold coin in treasure chest full of coins made from pyrite (fool's gold). That being said, you may be able to understand the very awkward position I am in when reviewing Sanction X�s The Last Day. Nothing about the album is bad, but there is no distinguishing quality between The Last Day and any other power metal band out there. Let�s face the facts. Trying to get noticed in a crowded market is a bit like being a sheep in an entire field of sheep that look just like you. If every sheep around you is bleating, then bleating along with them is not the way to get noticed. In order to get recognition, the sheep might have to learn a trick or two. This means innovation. A power metal band must do something a cut above the rest of the flock making new and interesting things to rise above them. 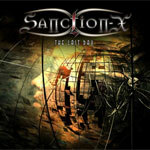 Otherwise, when an ordinary power metal band like Sanction X comes around, they will merely be perceived as another bleating sheep. In summary, if you�re the kind of person who enjoys all the power metal that saturates the European scene, then you will like this. It�s generic, it�s bland and if that�s you�re thing, good for you. If you�re the kind of person who enjoys all the power metal that saturates the European scene, then you will like this. It�s generic, it�s bland and if that�s you�re thing, good for you.